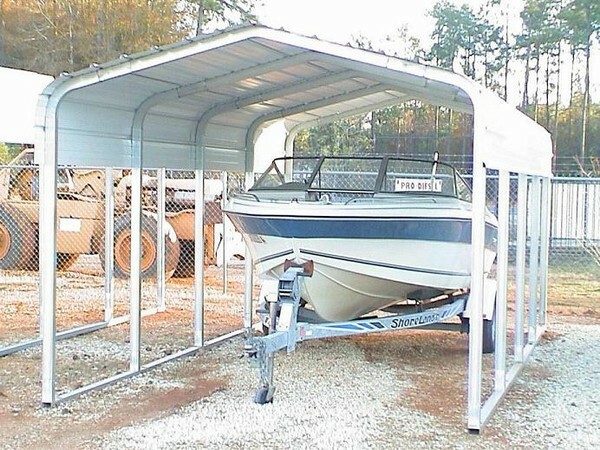 For superior strength and durability browse our extensive selection of metal carports to house trucks, RV’s, boats and more during off-season and foul weather. These carports are all-steel framing that use 2” x 3” heavy 14 gauge triple layer galvanized steel tubing that is resistant to rust, fire, termites and rot. The metal roofing is built of 29 gauge steel with an 80,000-PSI yield strength minimum. 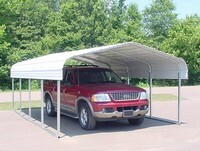 With ground anchors and a flat surface you can have your metal carport set up in minutes and quickly protect your vehicle or equipment. These durable steel structures are made to withstand high winds, heavy rain, accumulated snowfall and other natural weather conditions that can harm vehicles if left unprotected. These metal roofs will also protect paint and vinyl from harmful UV rays during spring and summer seasons. Complete metal carport kits feature all framing and hardware, painted steel roofing; vinyl trim and butyl caulk tape.